Below is the video recording of a Juicebox healthcare analytics product webinar. The video is about 45 minutes and includes our tips for successful launches, a quick data product demo, and a Juicebox Q&A session at the end. Our tips include which project tasks are best done slowly (e.g. getting your data ready) and which tasks need to move fast (e.g putting a working data product prototype in front of customers). Knowing what to do fast and what to do more slowly is a big part of the tips we share on the video. It is the the New Year, my favorite time for New Year’s resolutions. Time to look inward to see how we can change ourselves to change your world. Your data may replace their power in the decision-making process. They don’t have the data fluency skills to properly interpret the data and what it means for their decisions. They are afraid of changes that will impact how they do their work. Appreciating and acknowledging these fears is a first step in building trust with your users. Data products should enhance how people make decisions, giving them the right information at the right time. This is best accomplished when the data product can fit into the existing workflows so you are augmenting the user’s role rather than trying to change it. Patience is accepting that progress takes baby steps. This is a critical skill to help manage your data product ambitions. The possibilities for analytical features can seem limitless — there are so many questions that should be asked and answered. Beware this temptation. You’ll want to find the most impactful data first to allow your users to learn what they can learn. Before you try to do it all, have the patience to gather feedback and plan your next release. Analytics is best served by a growth mindset, the belief that taking on a challenge (and sometimes failing) with expand one’s mind and open up new horizons. Useful analysis begets questions, which leads to more analysis and even better questions. As a data product manager, you want to encourage this growth mindset in your customers, encouraging and enabling them to expand their understanding of their world. Every year I tell myself I need to be better at meeting new people and keeping up with old friends. It’s a good ambition if you are leading efforts on a data products. It takes a diverse set of roles to get the support and commitment in your organization. Have you gotten legal on board? How about IT security? Does marketing and sales understand the value of your data product and who you are trying to target? You may need to change the way people think about making use of data to build company-wide support for your solution. The following scene is one of the most pivotal moments in the Game of Thrones series. As a loyal viewer, this scene represents a turning point for Tyrion. He has reached a breaking point after a lifetime of conflict with his father. His speech is the moment that he sets out on a different path, a path that ultimately leads to (spoiler) the murder his father and (unsurprisingly) a deep schism with his family. For a new viewer, it is a courtroom confession in costume. Your experience of entertainment is entirely different based on the context you bring. It makes a world of different to know: Why we are here in this room? Who are these characters? What are their motivations? Context is the foundation that gives a scene something to build on. Context makes your audience care. It is the same thing when you design a dashboard, report, or analytical interface (with less beheading and back-stabbing). Lack of context — the set-up that explains the background and motivation for the data — may be one of the primary reasons why dashboards and reports fail to connect to audiences. And it may be the reason you can’t get your colleagues to open that spreadsheet you just sent. Why does this data matter to me? What am I about to see? What actions can I take based on this data? Let’s explore these three elements of context with a few examples. 1. Why does this data matter to me? Context should make it clear why the information is important. At Juice, we always start designing a data story by defining the audience we want to reach. It is best if we can be specific about the kind of person and role that they play in their organization. This person has things they want to accomplish that will make them successful. A good design takes all of that into account. When it comes time to show the data, there is no reason to be secretive about who should be engaging with the data and why it is designed for them. As an example, take the following introduction to an analytical tool the New York Times’ Buy or Rent Calculator. 2. What am I going to see? "Tell them what you are going to tell them, tell them, then tell them what you told them." This famous piece of advice is often ignored by dashboard and report designers. A title isn’t enough; you should explain the scope of the content and, ideally, how the different elements fit together. Is there a structure or framework that undergirds your choice of metrics? Explain this visually before tossing your audience into the deep water. One way that we’ve found to deliver this context is to provide an automated step-by-step tour of the content. You’ve undoubtedly experienced this approach when to try a new mobile app. The app designers walk you through the workflow and explain features. If done well, you’ve helped new users wrap their head around what they are going to see. The following example prominently features a descriptive legend showing how to read the glyphs. You may also want to consider ways how to help the user understand the interactions of your data interface or even show them the types of insights they can glean from the data. Here’s a great example showing survey data about the challenges women face in different countries. 3. What actions can I take on this information? Finally, effective context setting explains exactly how the data can guiding your audience to smarter actions. Your report or dashboard should lead to actions, not just show interesting data. It should point to what comes next. The following example shows data about inequality in travel visas by country. For an individual, the actionable question is: For my country, where can I easily travel to? Data products are inherently personal so you want to highlight this in your context. 1) Looking backward, what brought you to viewing this data? 2) Now, what should you see when they engage with the information? 3) Looking forward, what action can come from exploring the data? We’re continuing our tradition of the annual data gift guide. These are some of our favorite books and gift ideas for the data scientist, designer or analyst in your life. While you’re here take a look at the Juicebox product page to see what it looks like unwrapped. The Global Economy as You've Never Seen It: 99 Ingenious Infographics That Put It All Together - A pretty interesting way of explaining a subject using infographics. Privacy’s Blueprint: The Battle to Control the Design of New Technologies - An interesting perspective and emphasis on the role of designers with technology. Observe, Collect, Draw! : A Visual Journal Diary - Journal follow up to Dear Data with some cool conversation topics. #MakeoverMonday: Improving How We Visualize and Analyze Data, One Chart at a Time - A beautiful summary of the MakeoverMonday weekly project. We’re a little biased in this category, but these are the books on our desks that we refer to all the time. Data Fluency - Thinking about changing how your team or organization works with data?This is the book for you. Storytelling with Data - This one already feels like a classic. It provides simple, clear guidance on chart usage and storytelling. Hard not to reference it in the midst of a project. Weapons of Math Destruction: How Big Data Increases Inequality and Threatens Democracy - This is the book that keeps us grounded. Despite how much we think data is delicious and fun its serious too. The Man Who Lied to His Laptop: What We Can Learn About Ourselves from Our Machines - A seminal read on learning about interactions between humans and machines. Visualize This: The FlowingData Guide to Design, Visualization, and Statistics - Nathan Yau’s book that teaches us something new every time we pick it up. The Truthful Art: Data, Charts, and Maps for Communication - We love all of Alberto’s books, but this one is our favorite. Wonderful examples throughout the book. Paris: A sight-seeing Scavenger Hunt - pretty cool way to see Paris and other cities. 3422 Digits Of Pi Poster - Great conversation piece for the math lover or student. Vintage Data Media Poster - For anyone missing floppy disk or other old media. Useful Charts - One for your history buff. A series of infographic timelines. https://www.c82.net/ - Beautiful data art from Nicholas Rougeaux. This is a term of affection during the holidays. Data is the New Bacon T-shirt - This is top of list, again a little biased because we have a white paper with the same title. PolicyViz Data Visualization Board Game - We’re not sure where Jon @policyviz finds time, but this looks like a fun item. Collecting Data is My Cardio T-shirt - This is a tribute to the Juicebox Devops Team. Flash Drive Cufflinks - For the wannabe data spy/Edward Snowden in your life. Makeover Monday Swag - Another shout out to Eva and Andy. A book and apparel line in 2018. Floppy Disk Drink Coasters - Pretty self explanatory. Looks like the real thing. My son and I are really excited about the new NBA season. We are Atlanta Hawks fans, so we’re not too optimistic about this year. We know the team is young and has decided to undertake a rebuilding process. Our mantra for this season is the now familiar “trust the process”. If you’re not aware of the phrase “Trust the Process” comes from the Philadelphia Sixers rebuilding efforts over the past couple of years. What’s most interesting to me is that the formula for team success is much broader now. It is no longer just about having great players, but free agency positioning, analytical prowess, superior facilities and developing long-term successful franchises. It's all about the process now. I find the same can be said for delivering customer data and dashboard solutions. Much of the historical focus when deploying data applications (customer dashboards, embedded analytics, etc.) has been on selecting the right tool. However, despite so many more great tools and increased investment in the BI space, successful implementation rates have not improved. In a research piece by Dresner Advisory Services from May of this year, they highlight the fact that successful BI implementations are most often tied to having a Chief Data Officer (CDO). This makes a lot of sense because the CDO is just like an NBA team’s general manager. They bring accountability and experience as well as a process to make customer data solutions successful. Here are some elements that make process so valuable to delivering data applications and solutions. Launch Dates - A process is the best way to mitigate against missing the launch date. The existence of checklists, status updates, and documentation offer a means to anticipate risks that cause delays. Remember that delays to the product launch or release directly impact revenue and reputation. Missing product launch dates is not something that goes unnoticed. Customer Credibility - When delivery dates are missed, requirements miss the mark or dashboard designs don’t serve their audiences product confidence is lost. Its not only the customer’s confidence that we need to be concerned about, but also the sales and marketing teams. Once we lose the trust of these audiences it takes time to regain it, not unlike sports teams who fail to deliver winning teams over many years (see: New York Knicks). User Engagement - When there is no process that means there’s no planned effort to understand the audience and deliver the dashboard design. If users can’t understand the data you’re sharing with them, a cancelled subscription is a near certainty. Applications, not Dashboards - The best dashboards are purpose-driven applications. Tools don’t deliver purpose. The process undertaken to understand and solve a real problem delivers a purposeful solution. A Complete Platform - A dashboard solution is only a means of displaying data. A process defines ALL the requirements. Having a process recognizes that a complete solution is needed which includes security, user administration and application performance optimization. Much like NBA success, a successful customer dashboard implementation isn’t about picking a product (player), but sustained success over many years of increased subscription (tickets) revenue, fan engagement and loyalty. The path forward for distributing and delivering on valuable data applications is all about your process. In the event that you don’t have a process or a CDO leading your efforts, click here to learn about the Juicebox Methodologies. It's our way to design and deliver successful, on-time applications as well as wildly loyal fans. Trust the process. It works. The Future Belongs to Purpose-Built Apps. We're Betting On It. Witness the cloud of new buzzwords floating in the air. Let me see if I can knit these concepts together to shed light on their meaning and implications for the future of analytics. Collectively, these phrases are a reaction to the long-standing challenge of getting more data into more hands. “Democratization of data” can seem perpetually right around the corner (if you’re listening to vendor marketing) or a distant illusion (if you are in most organizations). At Juice we have a picture that we call ‘The Downhill of Uselessness’. 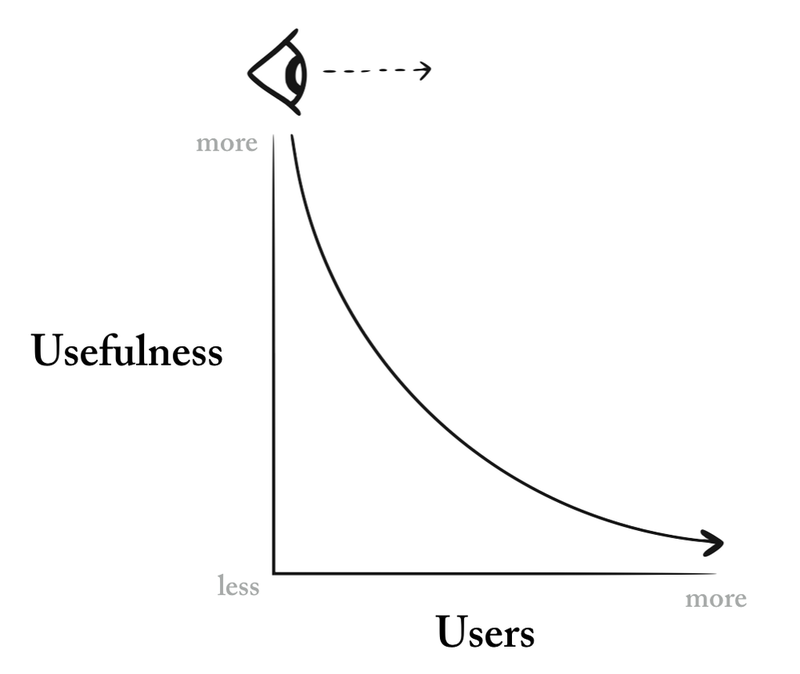 It shows how the usefulness of data seems to decline as you try to reach more users. On the far left, the most sophisticated data analysts and data scientists are happily extracting value from your data. But as you extend to the outer edges of your organization, data becomes distracting noise, TPS reports, and little-used business intelligence tools. The struggle of getting data to more people in more useful ways boils down to a few unsolved problems. First, general purpose platforms and tools (data lakes, enterprise data warehouses, Tableau) can be a foundation, but they don’t deliver end-user solutions. Second, reporting and dashboards deliver information, but often lack impact. In our experience, most data delivery mechanisms lack: 1) a point of view as to what is important; 2) an ability to link data insights to actions in a users’ workflow. Third, the people who truly understand the problems that need to be solved don't have the technical capacity to craft re-usable solutions. We all have that elaborate spreadsheet that is indispensable to running your business and, frighteningly, only understood by a single person. Focus on creating targeted solutions (applications) that solve specific problems. Apps can integrate into how people work and the systems where actions occur. They attempt to let people solve a problem rather than simply highlighting a problem. And applications are better than general purpose tools because they can bake in complex business rules, context, and data structures that are unique to a given domain. Give greater impact and influence to the people best know the problems. It has always been unfair to ask technologists to create solutions for domains that they don’t deeply understand. Solutions that start with the problem and craft an impactful answer. Their success is measured by fixing a problem rather than in terabytes of data stored. Cloud-based development environments requiring little coding ability (‘low-code’) — but requiring knowledge about the domain and the problem to be solved. …to be used by Citizen Data Scientists (CDS). the people who know the problems most intimately. At Juice, we may have backed into this trend or cleverly anticipated it. Either way, now I can say that Juicebox is a low-code hpaPaaS designed for CDS to create purpose-built apps. Better yet, we are now fully buzzword compliant. Is It Time to Jump-Start Your Data Offense? Legendary analytics guru Thomas Davenport takes a more neutral stance in his Harvard Business Review article What’s your Data Strategy? “Data defense is about minimizing downside risk, including ensuring compliance with regulations, using analytics to detect and limit fraud, …and ensuring the integrity of data flowing through a company’s internal systems. ...Data offense focuses on supporting business objectives such as increasing revenue, profitability, and customer satisfaction. Balance is fine. But at Juice, we’re all about building data products. That’s an offensive data strategy (we’re with you Jack Dempsey, June Jones, Mike Leach, and Mike D’Antoni). In practice, most organizations start from a defensive crouch. The relevant question is: when is it important that you shift to a more offensive data strategy? Davenport shares a few indicators that suggest more data offense is warranted. For example, offensive strategies are often employed at organizations that operating in largely unregulated industry where customer analytics can differentiate. He also sees opportunity for offensive data strategies at that those organizations with decentralized IT environments and where “Multiple Versions of the Truth” are encouraged. His HBR article even provides an evaluation tool to determine whether your organization has shifted its balance toward offense or defense, giving you a snapshot of where you’ve (organically) evolved. It doesn’t tell you where you should be. These organizations aren’t necessarily in the “competitive” markets that Davenport describes. Nevertheless, they are sitting on tons of valuable data that can shape conversations and influence the decisions of their constituents. We’ve worked with Chambers of Commerce, Universities, and State Departments of Education that are taking on offensive data strategies. There are hundreds of start-ups who are building their businesses on offensive data strategies. These companies have mechanisms for collecting data across an industry and are adding value through predictive algorithms, identifying patterns, and ultimately helping their customers make smarter decisions. We’ve working with a couple healthcare start-ups who have proprietary methods for predicting performance of healthcare providers. This is deeply valuable information for health systems and employers, and a purely offensive strategy. We’ve seen a couple different offensive data strategies by consulting firms. First, if they are delivering a project with an analytical deliverable, why not make the deliverable a recurring data solution? Another approach by the most innovative consultants is to view data collection and data products as an opportunity to proactively identify problems for clients. An annual survey of customer brand awareness can be turned into an incisive discussion starter, spurring clients to pursue the next project. If you are a market leader, you may be collecting enough data from your customers to be able to provide benchmarking solutions. In some cases, this offensive strategy is core to the original purpose of the business (e.g. US News & World Report’s surveying of colleges). In other cases, the opportunity to create new data products can be a result of “data exhaust”. If you find yourself wondering how your data might be turning into a revenue-generating or customer-differentiating solution, you should download our ebook Data Is the Bacon of Business: Lessons on Launching Data Products. Is Your Data Product Ready for Launch? Looking to transform your data into a valuable, customer-facing data product? From concept to design and launch, we've worked with dozens of companies to create successful data products. Our checklist provides seven evaluation criteria to see if your data product has what it takes to succeed. Meet users where they work? Guide users to insights and actions? Make users feel safe and in control? Bring credibility to your data? Have the ability to operationalize the solution? Over the years, we’ve had the pleasure to work with many great individuals and companies and through our work have gained the ability to sympathize with their experiences of what we like to call “going from 0 to 100." No, we’re not endorsing excessive speeding in your car. We’re talking about going from having nothing but hopes and dreams about delivering engaging analytics (0) to having an interactive data story that your users don’t want to put down (100). Because we’ve focused our efforts on taking clients from 0 to 100, commonalities or trends for best practices in the data and design experience (read: everything between 1 and 99) have become increasingly clear. Use these four tips to make your introduction to data products a better, more frictionless experience. What do the end users you have in mind for the product look like? What questions will users ask of the data? What actions will they take with the answers to these questions? These are all things you should know before beginning to work on data products. Be specific about for whom you are creating a data product. If you try to provide insights for too many types of business roles you run the risk of making it too broad for any role to gather insights from the data. When putting together the data to be used in your product, it’s important to discern the difference between “more data” and “more records." More data: It’s not always in your best interest to gather the most “data” possible. By doing this, you run the risk of gathering data that you may not use and wasting money in the process. More Records: Gathering “more records” (read: rows of data) is a better strategy as you prepare for your data product. Doing so can alleviate the effects of outliers and unearth trends in the data. Building out all the bells and whistles you think you might need at the beginning the data product’s life can be expensive. Starting with an MVP that is put in the hands of actual end users will help determine what data is actually needed and what design aspects are best for your purposes. Helps with data: Starting with an MVP helps determine the shape and caveats that exist within your data, and allows your users to make decisions about what data is most important to them. Helps with design: By starting with an MVP, all of the questions that you and your users have for the data are answered by the design. Additional features can then be added from that point on in a more cost-effective manner. We won’t get into data visualization principles in this section because that warrants a totally separate article, but a simple point here: just because you saw similar data in a pie chart once doesn’t mean that is the only (or best) way to visualize your data. Because your users are the ultimate consumers of the data, let them be the judges of what visualizations will be most effective for them. Easy peasy, right? We think so, but maybe that’s only because we’ve helped so many customers get from 0 to 100. If you're still not sure what your next steps should be, we’re here to help. Learn more about our 0 to 100 process by checking out the document below. This is the first in a multi-part series on launching successful data products. At Juice, we’ve helped our clients launch dozens of data products that generate new revenue streams, differentiate their solutions in the market and build stronger customer relationships. Along the way, we’ve learned a lot about what works and doesn’t. In this series I’ll take you through what you need to know to design, build, launch, sell and support a data product. The first step in building a great data product is to pinpoint a customer need and determine how your unique capabilities will solve for that need. The capabilities you have to enhance the value of the data to make it as useful as possible. Take the Academic Insights data product we designed and built for US News and World Report as an example of finding this intersection. (1) Their customers, university administrators, needed to understand how they compare to peer institutions and where they could best invest to improve their performance and stoke student demand. (2) US News was sitting on decades of detailed survey data and rankings to compare universities of all types. This data was unique in its breadth and historical coverage. However, the data was essentially stored in old copies of the paper magazine, not a format that was conducive to delivering insights to their target audience. (3) That’s where our data visualization and user experience capabilities helped them turn this data into a web-based analytical tool that focused users on the metrics and peer groups they cared about. We’ve noticed a temptation with data products to forget the cardinal rule of any product: it needs to solve a specific problem. Without this focus, a data product comes in the form of a massive 100-page PowerPoint deck or a collection of raw data tables. There may be value in the data, but it is clear the product manager hasn’t thought deeply about their customers and what the data can do to solve their problems. I spoke to a credit card executive recently who mentioned how his bank spent huge sums of money on benchmarking reports. Despite his deep experience, he was unable to make sense of the reports he was sent. These are lost opportunities to deliver powerful data products. With data products the core question of your user is: What information or insights will let you make better decisions and perform better in your job? Look for those unique situations where indecision, ignorance, or lack of information are blocking smart actions. Rather than solving your user’s pain, you need to enable them to solve their own pain. Physician, heal thyself. 2. What’s unique about your data? Breadth: Do you have visibility across an entire industry? Or population segment? Breadth allows you to provide benchmarks and comparisons that aren’t otherwise visible to your customers. One of our clients has data on the learning activities of more than 60% of all healthcare workers. Depth: Can you explore deeply the behaviors of individual people, companies, or processes? By drilling into these activities, you may have the power to predict future behaviors or find correlations that aren’t visible to others. Fitbit tracks massive amounts of personal activity data from each individual user. Multiple data perspectives: Are you in a position to combine data sources across industries or connect disparate data sources? By bringing together different perspectives on your subject, you may be able to answer new types of questions or explain behaviors through a multi-faceted perspective. Naturally, having breadth, depth and multiple perspectives is best of all. Companies like Google, Apple and Amazon have profound data assets because they can both see human behaviors across a large audience and they know a lot about each individual. It is seldom enough to create a data product that is simply a pile of data. That isn’t to say we haven’t seen many companies that believe that a massive data extract represents a useful solution to their customers. People don’t want data, they want solutions. Visual representations that reveal patterns in the data and make it more human readable. Predictive models to take descriptive data and attempt to tell the future. Industry expertise to bring understanding of best practices, presentation of the best metrics, analysis of the data, and thoughtful recommendations. Bake your knowledge of the problem and the data into a problem-solving application. Enhancing the data through segmentation, pattern recognition, and other data science tools. For example, comments on a survey can be enhanced with semantic pattern recognition to identify important themes. Enabling users with features and capabilities to make them better in their job. The user's ability to analyze, present and communicate insights can be a value-add to the raw data. If you can determine the right recipe of customer need, data and value add, then you've gone a long way toward defining the foundation of your data product. But before getting down to designing the data product, you'll want to get the right people in place. We’ve helped launch data products in many industries including healthcare, education, insurance, advertising and market research. The most important factor in turning a concept into a business is a quality product manager. The best product managers have a vision for the product, understand the target customers, communicate well, are definitive in their decisions and recognize the reality of technical trade-offs. For a more complete list of general product manager skills, check out this Quora answer. For data products, we’d emphasize a few more skills. The product manager needs to understand the data, what it represents and the business rules behind it. It helps if she is a subject matter expert, but if not, she should know when to bring in more expertise. Finally, she needs to understand the technical challenges involved with building a data product and be able to weight the impact of changes (which are often necessary as you learn more) against the benefits of launching sooner and gathering customer feedback. Is IT on board to provide development support, data access and data security resources and sign-off? Is the COO ready to provide resources after launch to support and maintain the product? Is your legal team confident that the data you’ve been collecting and incorporating into your data product is available for this new purpose? Is the marketing team ready to support a product launch that includes all the resources, collateral and creativity required of any new product? Is the sales team in place to understand the product, the target audience and establish the sales framework for pushing the product? For data products, this means finding your sweet spot at the intersection of customer needs, your data, and data product value add. And then getting the right people lined up to make your product a success.